Each Memorial Paver is customizable with up to 3 lines and 20 spaces, each paver costs $250.00. There are two ways to request an Engraved Memorial Paver. Please click on this link to print off the Memorial Paver form, complete the form, and return it to the Shrine office. One form is required for each Memorial Paver. If you wish to request more than one Memorial Paver, please return one form for each paver. We ask you to complete the purchase by including payment with the submitted forms, or you may pay online using this link. Please note on the form that you remitted payment online. Please remit $250.00 for each Paver requested. Please complete the online form below for each Memorial Paver requested. If you wish to request more than one Memorial Pavers, please fill out the online form for each Memorial Paver individually. You will receive an email for each Memorial Paver requested. After you complete the online form for all Memorial Paver(s), we ask you to complete the purchase by sending your payment to the Shrine office, please note ‘Paver’ in the memo line, or you may pay online using this link. Please remit $250.00 for each Paver requested. Please note, when we sell the first 100 Memorial Pavers, we will begin installation on the south side of the Holy Family statue, weather permitting. With every additional 100 pavers sold, another installation will take place. 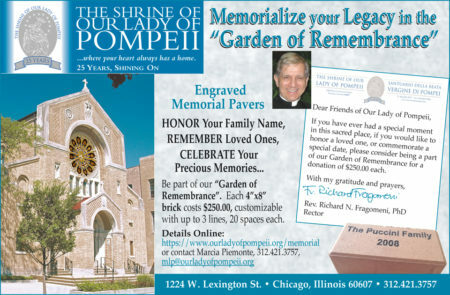 Please make checks payable to “The Shrine of Our Lady of Pompeii” and submit forms and checks to Marcia Piemonte. Please contact Marcia at via email or 312.421.3757, x310 with questions.